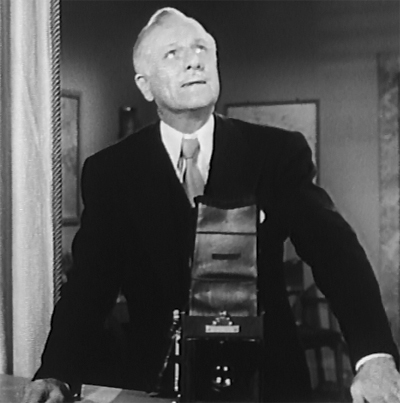 Above: Pierre Watkin as Perry White has just missed a chance to photograph one of Superman’s feats in Atom Man vs. Superman (Columbia, 1950). 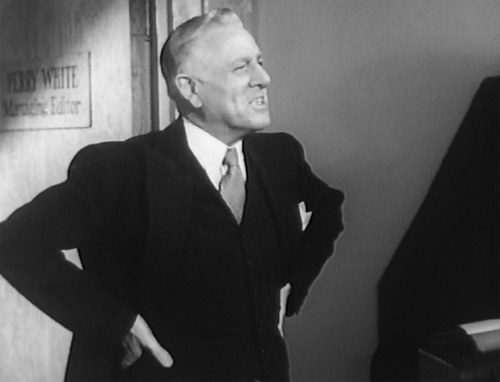 The gray-haired and crisp-voiced Pierre Watkin was almost invariably cast as prominent businessmen, white-collar professionals, and civilian or military officials over the course of his 25-year career as a Hollywood character actor. His screen personality was more sharp-edged than that of many other specialists in such respectable roles; though always briskly dignified in demeanor, he could also be suave, crafty, and acidly sarcastic, and thus was able to play antagonistic or villainous authority figures as skillfully as he played helpful and honest ones. Watkin brought his character-acting skill to the serial world on multiple occasions, but made his biggest mark on the genre in Columbia’s two Superman outings–in which he turned in a pair of excellent performances as the courageous but irascible newspaper editor Perry White. Pierre Frank Watkin was born in Cherokee, Iowa; he spent his childhood in an actors’ boarding house that his parents operated in nearby Sioux City–which probably influenced his decision to join the theatrical set himself. By 1910, young Watkin was working as a stage actor; during the remainder of the 1910s and the first half of the 1920s, he toured as a member of various Midwestern stock companies. By 1926 he had formed his own company, the Pierre Watkin Players, but left the Midwest for the East Coast shortly thereafter; by 1928 he was appearing on Broadway. Watkin worked steadily on the New York stage until 1935, when he moved to California and began a new career as a movie actor; he had already played many professional and official characters on the stage, and quickly became typecast in similar roles on the screen. The second half of the 1930s found him portraying lawyers, politicians, realtors, film directors, and the like in feature films for Columbia, Republic, Warner Brothers, Paramount, and virtually every other major and minor studio in Hollywood. Watkin made his first serial, Universal’s The Green Hornet Strikes Again, in 1940; though he was cast as the serial’s brains heavy, he received comparatively little screen time. His character, an urbane racketeering kingpin named Crogan, didn’t leave his office once in the course of the serial, and was usually given only one scene in each chapter–appearing just long enough to hatch plots with his henchmen and send them out to do battle with the masked crime-fighter the Green Hornet (Warren Hull). Watkin played this limited part with energy and polish–snapping acidly or sneering sarcastically at his henchmen, and parrying the good guys’ questions with oily suavity when he finally got a chance to interact directly with them in the serial’s last chapter. 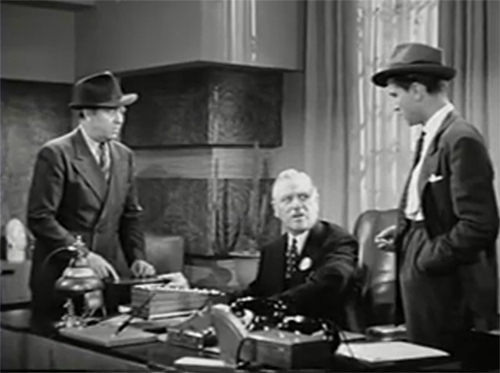 Above: Pierre Watkin gives orders to Arthur Loft (far left) and Jack Ellis in The Green Hornet Strikes Again (Universal, 1940). Watkin worked steadily as a freelance character actor throughout the 1940s; as during the late 1930s, he worked at both big and little studios, taking roles of varying size but almost always playing someone in authority. He didn’t make another serial until 1947, when he appeared in Columbia’s Jack Armstrong–which gave Watkin one of his biggest chapterplay roles, albeit one that he was rather poorly suited to. Based on a popular radio show, this decidedly weak serial co-starred Watkin as aircraft manufacturer Jim Fairfield, who journeyed to a remote Pacific island in search of a missing scientist, accompanied by his niece Betty (Rosemary LaPlanche), his nephew Billy (Joe Brown Jr.), and their best friend, high-school athlete Jack Armstrong (John Hart); once on the island, Armstrong and the Fairfields found themselves forced to battle the villainous would-be world conqueror Jason Grood (Charles Middleton). 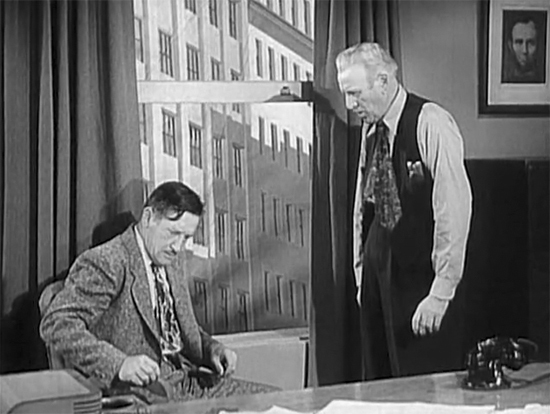 As in the Armstrong radio show, the Jim Fairfield character was presented as a co-hero who regularly participated in fights and shootouts, a seasoned adventurer whose maturity balanced out youthful Jack’s impetuosity; however, this dynamic simply didn’t work in the serial, due to the miscasting of the two heroes: John Hart, thirty years old and tough-looking to boot, made a most unbelievable “All-American Boy,” while Watkin, only a year short of sixty, was simply too elderly to be believable as a daring man of action. Watkin’s natural dryness and aloofness also made it hard for him to give “Uncle Jim” much in the way of avuncular warmth; overall, he came off more like a corporate chairman of the board than an action hero. Still, he played his part with emphatic self-assurance, and did make Fairfield seem quite intelligent, whether he was shrewdly questioning the hypocritically friendly Grood or coolly discussing strategies with his younger associates. Above: Pierre Watkin catches Charles Middleton (back to camera) in a lie in Jack Armstrong (Columbia, 1947). Above: John Hart and Pierre Watkin do a bit of pondering as John Merton lurks behind them in Jack Armstrong. Jack Armstrong’s producer Sam Katzman gave Watkin several more serial roles over the next few years; the first of these assignments was the part of eminent geologist Professor Salisbury in Brick Bradford (Columbia, 1948), an uneven and frequently absurd science-fiction chapterplay. Watkin had much less to do in Bradford than in Armstrong; though he occasionally got to provide “scientific” verbal exposition or join hero Brick Bradford (Kane Richmond) in fantastic explorations, he ceded the former function to Dr. Tymak (John Merton) and the latter to Sandy Sanderson (Rick Vallin) for most of the serial, spending the bulk of his screen time in the background along with nominal heroine Linda Johnson (who played Salisbury’s daughter June). However, though Watkin’s Bradford role wasn’t as big as his part in Armstrong, it definitely fit him more comfortably; as in the early serial, he gave an appropriately astute, calm, and confident sound to his lines–but wasn’t forced to regularly engage in unconvincing battles with much younger thugs. 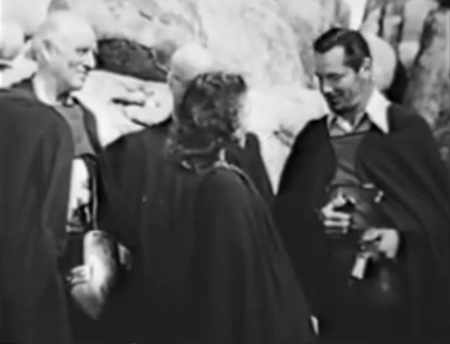 Above: Pierre Watkin smiles as lunar colonist Helene Stanley (back to camera) offers to show Kane Richmond (far right) around the Moon in Brick Bradford (Columbia, 1948). John Merton is partially hidden behind Stanley. 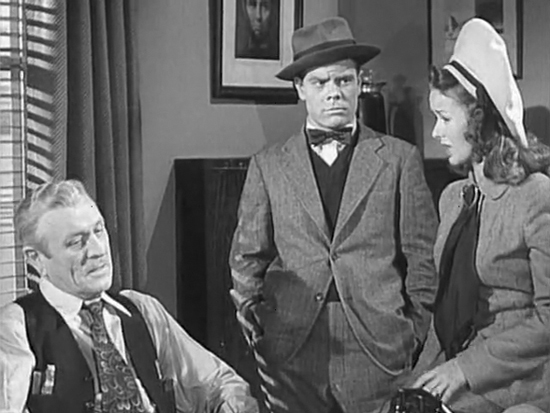 Watkin received the meatiest of his chapterplay roles not long after Brick Bradford’s release; as aforementioned, the serial Superman (Columbia, 1948) cast him as Perry White, choleric editor of the Daily Planet newspaper and employer of reporter protagonists Clark Kent (Kirk Alyn), Lois Lane (Noel Neill), and Jimmy Olsen (Tommy Bond). The first live-action film adaptation of the famed DC Comics feature, Superman was one of Katzman’s better Columbia serials; its good script and strong leading performances combined to breathe real life into the serial’s characters–including White, who established a strong presence in the serial without ever leaving his office, thanks to amusing dialogue and to Watkin’s excellent handling of said dialogue. Watkin tempered White’s perennial irritability with an air of shrewd intelligence; the dryly sarcastic tone that he gave to the editor’s many annoyed put-downs of his reporters made the lines sound more like sharp witticisms than mere pompous blusterings. The resolutely unsentimental way in which Watkin’s White occasionally thanked or complimented his employees also helped to individualize the character, as did Watkin’s brusquely confident bearing when White reacted to radio ultimatums from the villainous Spider Lady (Carol Forman) or confronted one of her henchmen. Above: Pierre Watkin reacts to bad news from Noel Neill in Superman (Columbia, 1948), as Tommy Bond watches. 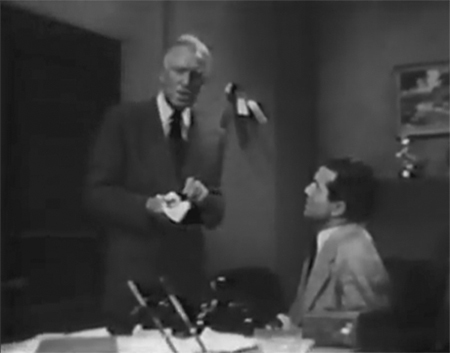 Above: Pierre Watkin ferociously grills villain Jack Ingram in Superman. 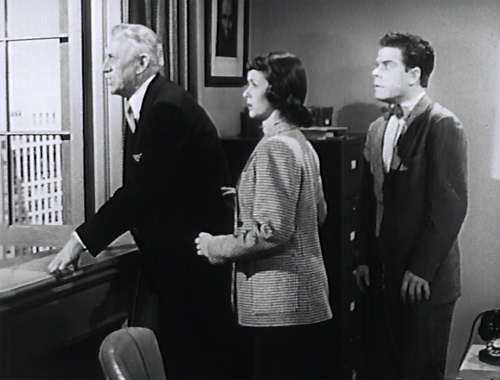 Watkin reprised the Perry White role in Atom Man vs. Superman (Columbia, 1950), a sequel to Superman that pitted its hero against the mad scientist Luthor (Lyle Talbot). Watkin again played White as a cagy, sardonically witty, and hard-driving newspaperman, making him consistently acerbic but also making him highly entertaining to watch, and conveying an unshakable devotion to news-gathering in the face of danger that made him seem admirable, despite his prickly personality. 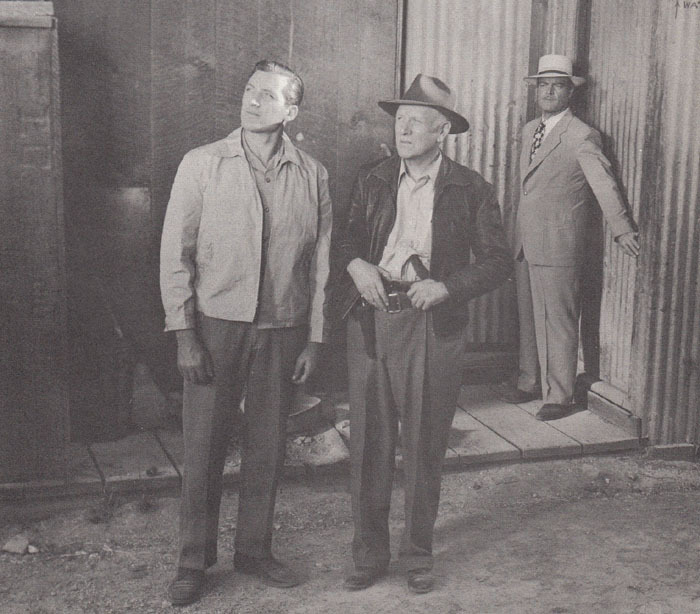 Though Watkin appeared in some A and B features during the 1950s, he focused principally on television work as the decade wore on, appearing as sheriffs, judges, doctors and similar types on numerous TV Westerns, comedies, dramas, and mysteries. He also played three more serial roles–all of them small ones–during the early 1950s. King of the Congo (Columbia, 1952) featured him briefly in its first chapter as a good-natured but very businesslike Air Force officer who assigned hero Buster Crabbe to infiltrate a Communist spy ring in Africa, while The Lost Planet (Columbia, 1953), gave him a slightly larger role as newspaper editor Ned Hilton, who appeared in two chapters to react with annoyance and disbelief to reporter hero Rex Barrow’s (Judd Holdren) account of fantastic science-fictional doings–and who was annoyed further when he accidentally activated an invisibility device left behind by Barrow. As in the Superman serials, Watkin used an acidic delivery to make the editor’s sarcastic remarks entertaining, although the character was much more of a one-dimensional grouch than Perry White had ever been. Watkin played his last serial part in Canadian Mounties vs. Atomic Invaders, as an affably self-possessed RCMP commissioner named Morrison; he gave the hero (Don Henry) his general orders in the first chapter, and reappeared in the serial’s three concluding episodes to receive Henry’s progress report and crisply assist him in summing things up at the fadeout. 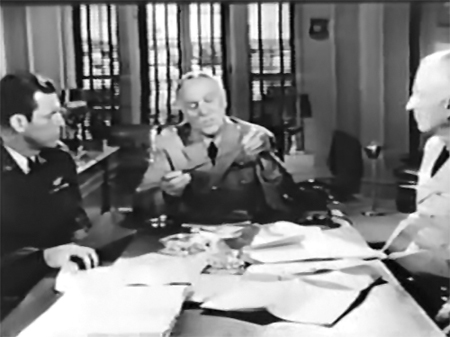 Above: Pierre Watkin shows some suspicious microfilm to Buster Crabbe (left) and another military officer in King of the Congo (Columbia, 1952). Above: Pierre Watkin listens in stunned disbelief to Judd Holdren’s account of his adventures on The Lost Planet (Columbia, 1953). 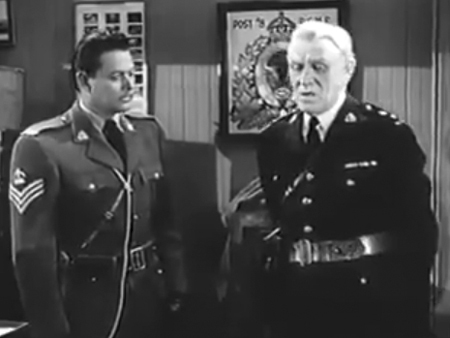 Above: Pierre Watkin briefs Bill Henry in Canadian Mounties vs. Atomic Invaders (Republic, 1953). 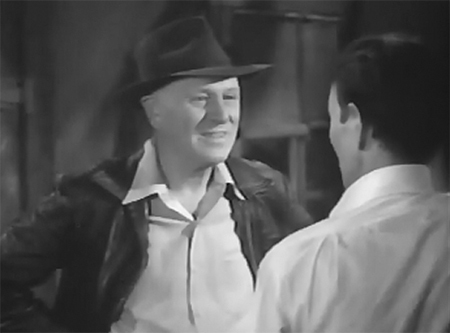 Despite advancing age, Watkin worked steadily as an actor during the later years of the 1950s, appearing frequently on television and occasionally in features; in fact, he stayed active in Hollywood right up to the end of his life–which came in 1960, shortly after his final screen appearance in an episode of Wanted Dead or Alive. Even when hampered by miscasting or relegated to minor parts, Pierre Watkin enhanced his serials with his urbane but assertive screen personality; he was able to enhance them even more when he was awarded a really plum part–namely, the role of Perry White. His energetic, intelligent, and sharply humorous portrayal of that relentless newspaperman ranks as one of the serial genre’s best character turns. Above: “May I remind this gay, festive crowd that we have an edition to get on the street?” Pierre Watkin’s Perry White caustically breaks up a newsroom birthday party in Atom Man vs. Superman (Columbia, 1950). Acknowledgements: The biographical and career information in this article was derived from online census documents and from the Old Corral’s Pierre Watkin page.